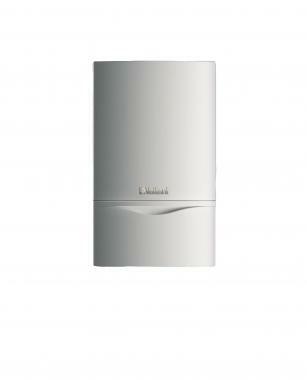 The EcoTEC system gas boiler is a condensing and wall mounted model designed and manufactured by Vaillant. It’s a system boiler so it directly heats your central heating system and hot water storage cylinder. Most of the important parts of the hot water and heating system, such as the pump and expansion vessel, are built in on a system boiler making it quicker and cleaner to install. It also means you get a faster response to demand for heating and hot water, plus you don't need to have a feed and expansion tank in the loft. It comes with an efficiency rating of 95.5% making it a boiler that is A rated. This boiler also comes with an output of 65kW making the unit suitable for those larger homes with two or more bathrooms. It comes with a range of flues, fittings and accessories, helping the boiler to be able to be placed just about anywhere. It can be installed with a cascade to provide an extremely efficient yet flexible heating system. This boiler, being a compact and lightweight unit, helps to save you time and money. It boasts a high quality stainless steel heat exchanger to offer protection from corrosion and a pump included and integrated connection for expansion vessel. It has built-in two stage frost protection to help protect your boiler from freezing over in those cold wintery months when you need it most, as well as protecting it all year round. It comes with a fully modulating low NOx burner, lower NOx emissions, easy access to all components from the front, a single electronic circuit board and a flue gas analysis point. This boiler is equipped with an air separator with auto air vent and filter to remove fine particles. With this highly reliable boiler comes 2 years warranty, to give you peace of mind that it will not let you down.